FlippyCat, the creator of the domino version of Starry Night, is a Canadian domino artist who sets up elaborate domino constructions just so that he can knock them down, creating a portrait, painting, holiday greeting – even Downton Abbey. If you haven’t already stopped reading to watch Starry Night, you may want to do so before continuing this post. 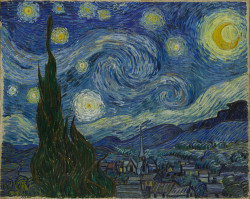 Let’s consider the domino version of Starry Night the equivalent of a piece of music. When we walk out on stage to perform (from memory), our brain initiates a “motor-action plan” that puts a certain sequence of musical events into play. As long as nothing interrupts the motor plan, the music continues to unfold, just like the dominoes continue to fall, once they start. We end up with a completed performance of a musical piece – just as the falling dominoes create a version of Starry Night. But FlippyCat’s dominoes don’t always fall as they were intended to, and sometimes we don’t get to the end of the piece without something going wrong – at best, a small slip from which we recover; at worst, total derailment. In the text below the You Tube video, FlippyCat says that the first attempt failed because he dropped a screw from the camera rig onto it. That’s not unlike something unexpected happening in performance that causes us to lose focus and forget where we are – maybe there is a lot of coughing in the hall, a cell phone ringing, a door slamming shut. A dog even wandered up on stage during one of my concerts. In the second attempt, FlippyCat says that he didn’t complete one line, and he left out a domino that stopped the reaction. That’s somewhat the equivalent of our motor-action plan not proceeding smoothly because we miss a note or chord and it throws us off, causing us to forget what comes next. When something happens that prevents the dominoes from falling, the domino version of the painting isn’t completed. But unlike dominoes, if we have learned and memorized well, we can rely on other cues (structural, key relationships, patterns – sometimes called performance or retrieval cues) to be able to pick up our interrupted motor-action plan and continue the performance. Many of us learned as students that motor memory is the worst kind of memory and the first to disappear in a stressful situation. But in fact, when we learn a piece of music, the movements necessary to play it form neural pathways in the brain, and as we repeat or practice those movements, the neural pathways are strengthened. So motor memory is extremely important, but the neural pathways related to many other aspects of the piece are also important. Let’s do a bit of Brain 101 to better understand what’s happening in the brain when we make music. Our brains have about 86 billion neurons or nerve cells (the estimate used to be 100 billion, but the latest research puts it at 86), and they can combine in an infinite number of ways. Each cell has a cell body, many branches called dendrites surrounding the cell body, and one axon that leads away from the cell. 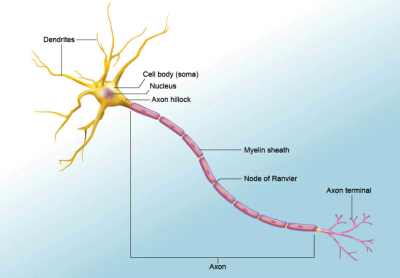 Information comes into the cell through the dendrites and out through the axon. The terminals at the end of the axon connect to dendrites of another neuron over a gap called a synapse. When we learn to play the piano, learn a piece of music, learn a foreign language, neural pathways are formed from chains of neurons connecting together. Movement is necessary to create sound, so obviously the motor pathways are extremely important. But when we practice, we are often concerned only with the motor aspect of playing – with the technique we need to play the piece and with how to improve that technique. But the many other neural pathways connecting all of the other areas of the brain involved in making music are also extremely important. The more conscious attention we pay to strengthening these pathways – the better recall we are going to have at our disposal when it comes time to perform. That means being sure that our auditory pathways are always as strong as the motor pathways – that we can hear everything in our minds that we are going to play. It also means creating strong pathways with all the other information about the piece, with all of the cues we need to keep the motor program going: structure, key relationships, patterns – the retrieval cues. I’ve always played a lot of contemporary music, some of it music that has been written for me. I used to memorize everything – whether it was 12-tone music of Schoenberg and Boulez, minimalist or post-minimalist music of composers like Robert Ashley or William Duckworth (in some ways more difficult to memorize than Boulez), music using complex isorhythmic structures by composer Kyle Gann, or music played inside the piano by composer Annea Lockwood. At some point, I realized that I was more comfortable and had less performance anxiety playing contemporary scores from memory than performing the standard repertoire from memory. Before you say, “that’s because no one will know if you make a mistake when you play contemporary music,” let me assure you that was not the reason. I would know – and of course, the composer was often sitting in the audience, and he/she would definitely know if I forgot part of the piece. But I came to the realization that I was more comfortable performing the contemporary scores because I had learned and memorized them in a totally different way than standard repertoire. With standard repertoire, I relied heavily on my ear. I could hear the pieces in my mind. My auditory-motor pathways were well-myelinated. But with contemporary music, it wasn’t so easy to rely strictly on my ear and I had to have many more cognitive “back-ups” in place: knowledge about structure, sections of the piece, patterns, exact make-up of chords, and, in the case of pieces played inside the piano, where particular strings were located in relationship to the frame. My memory was much more solid and secure because I had created strong neural pathways in the brain carrying multiple kinds of information. My motor-action plan had a lot more backups. FlippyCat builds his structures with key dominoes in certain places that will keep the reaction going – will keep the dominoes falling, whether in a straight line, a curved line, going around a corner, or vertically, as in his multi-layered structures. How do we create the equivalent of those key dominoes in our brains so that we keep the motor plan going when we perform a piece of music? *If you don’t know Daniel Coyle’s The Talent Code: greatness isn’t born. it’s grown. here’s how, you should check it out. The premise of his book is “skill is insulation that wraps neural circuits and grows according to certain signals.” He is talking about myelin, the insulation that grows around the axon of a brain cell the more often we use it. Coyle looks at hotbeds of exceptional skill in such diverse places as a soccer field in Brazil; Meadowmount, the summer music school in upstate New York; golf courses in South Korea; the Op. 118 string program in Harlem, and many others. His conclusion: talent isn’t something you either have or don’t have. It can be created and nurtured – and myelin is at the heart of it all. Concerning the premise of “The Talent Code,” (a book I confess I haven’t read and almost certainly won’t——), i.e. “that greatness isn’t born, it’s grown,” I have to say that I think such an optimistic view can only go so far. It seems to me that people gifted with phenomenal abilities in music show their “talent” at such an early age that it can’t possibly be attributed to “growing” myelin sheaths——-such “networks” must already be in place and accessible. Or perhaps some other physiological factors are involved in photographic memory and perfect pitch let alone exceptional creativity. I’m convinced that some things cannot be learned, no matter how much wishful thinking is involved. Of course, you’re entitled to disagree! Dear Robert, Thank you for your comments. I agree Coyle’s view only goes so far, and that talent, or musical intelligence, (as Howard Gardner would call it), absolutely plays a role. And I spoke directly to that in the post Triple axels and the piano. But given that, no one becomes an expert without significant myelination, and those layers of myelin “grow” through practice. Any of us who teach a musical instrument have encountered students who have a significant amount of talent, but who don’t get anywhere because they aren’t willing to put in the work. Scientists at the Karolinska Institute in Stockholm looked at piano practicing in childhood, adolescence, and adulthood and found that the amount of white matter (which is myelinated axons), correlated with amount of practice time. They found that childhood practicing was important for white matter plasticity (“growing” of myelin), that it continues well into adulthood, and that these changes in myelination are necessary for high-level performance. Changes in white matter have also been found in Karate experts, although obviously in different parts of the brain. 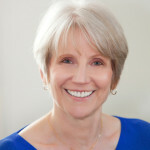 And Coyle, in The Talent Code,does speak to several other factors contributing to becoming an expert, but one can have all of those other factors, and without practice and the resulting myelination, achieving excellence won’t happen. Thanks for writing. I just came across your blog and it is timely as I have just chosen my pieces for a piano exam that I would love to finish for next Spring. Memorization has always been extremely difficult for me and I have a hard time trusting it! I have been reading up on it to see if I can improve it and I’m really working at learning to ‘chunk’ as I learn the piece instead of learning it to the degree I usually do with no plan to memorize in that process. Hi Andrea, The next post will have more specific suggestions about how to practice in order to make learning and memory more secure. It should be up within a week – hope you’ll find it helpful.